Photographed at Eldoret, Kenya. April 2011. The bill is conical and dark gray while the head is gray. Reddish brown on the back and pale gray chest. The several subspecies and varieties described in Birds of Kenya (Zimmerman et al.) are elevated to full species by some authorities. Casual observers might prefer to spend time differentiating the many more colorful species of birds native to Kenya. 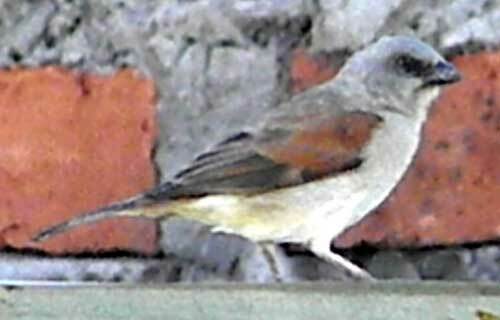 I believe the bird shown here is of the typical variety and is widespread in Kenya and much of Africa.